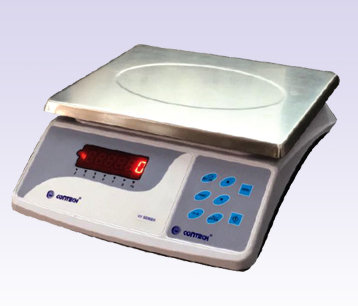 Tabletop Scales, Table Top Digital Scales, Electronic Table Top Scales, Tabletop Scales Manufacturer, Mumbai, India. Contechoffers total weighing solution for all the Industrial segments with various options. The applications are Table Top Scales, Piece Counting Scales, Platform Scales, Floor Scales, Pallet Scales, Waterproof Scales, Flameproof Scales, etc. * Incorporate high quality loadcells. * Multiple weighing units, Gram, Kilo gram, carat, litre, pound. * Piece counting facility, upto 25 different types. * Storage of weights in memory and printing, upto 100 weights. * Bi-directional RS232 interface to connect with computers and printers. * Set point facility up to 2 limits with relay output (potential free contacts) - optional. * Peak hold facility (Optional). * Date and time facility. * Multiple print options with Sr.no, date, time and weight in horizontal/vertical mode. * User selectable Tare/Zero mode option with Net/gross facility for minimum use. * Overload & Shock load Protection. * Bright LED display, high Bright Green LED display (optional). * Battery backup (optional). Rechargeable sealed maintenance free battery. Company was awarded ISO 9001 : 2008, ISO 14001:2004, OHSAS 18001:2007 From UKAS Management Systems in the year 2014. We are Looking For Dealers.